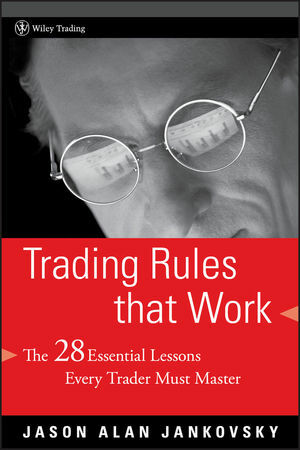 Trading Rules that Work introduces you to twenty-eight essential rules that can be shaped to fit any trading approach—whether you’re dealing in stocks, commodities, or currencies. Engaging and informative, Trading Rules that Work outlines the deeper psychology behind each of these accepted trading rules and provides you with a better understanding of how to make those rules work for you. JASON ALAN JANKOVSKY has been a trader and market analyst for over twenty years. He provides daily commentary on the markets for Infinity Brokerage and is the featured speaker on a daily Internet broadcast, The Morning FOREX Briefing, sponsored by ProEdgeFX. Jankovsky has authored several trading systems, trained other successful traders, and written numerous articles on global cash FOREX. For a detailed list of resources and tools available from the author, please visit www.proedgefx.com. PART I Getting in the Game. RULE #1 Know Your Game. RULE #2 Have a Trading Plan. RULE #3 Think in Terms of Probabilities. RULE #4 Know Your Time Frame. RULE #5 Define Your Risk. RULE #6 Always Place a Protective Stop. RULE #7 Your First Loss Is Your Best Loss. RULE #8 Never Add to a Loser. PART III Letting Profits Run. RULE #10 Keep Good Records and Review Them. RULE #11 Add to Your Winners. RULE #12 Use Multiple Time Frames. RULE #13 Know Your Profit Objective. RULE #14 Don’t Second-Guess Your Winners. RULE #15 Know the Limits of Your Analysis. RULE #16 Trade with the Trend. RULE #17 Use Effective Money Management. RULE #18 Know Your Ratios. RULE #19 Know When to Take a Break. RULE #20 Don’t Trade the News. RULE #21 Don’t Take Tips. RULE #22 Withdraw Equity Regularly. RULE #23 Be a Contrarian. RULE #24 All Markets Are Bearish. RULE #25 Buy/Sell 50% Retracements. RULE #26 The Only Indicator You Need. RULE #27 Study Winning Traders. RULE #28 Be a Student of Yourself.